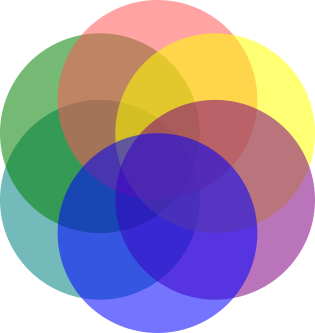 Make a copy of the circles, and put it aside (for the colors). Keep it untouched. Duplicate the circles, combine the duplicated ones. Now you've got the pieces. Next you can go about re-assigning the colors with the dropper tool (it may be useful to add a stroke to the pieces temporarily). Tab through the objects (I mean the tab key), and click on the corresponding color of your 'backup copy' with the dropper tool. Another (faster, but less exact) way would be to: Make a bitmap copy (Edit > Bitmap copy), and then to do a trace of it, with the correct amount of colors, via Path > Trace bitmap. Another inexact option would be to use the paint bucket tool to fill the differently colored fields. Not the answer you're looking for? Browse other questions tagged vector inkscape shapes or ask your own question. How to split an icon into 3 different objects?